A little late to reply to this, but I lucked into this can release while in town for the vintage Krug dinner. Wifey and I had never been to Monkish, and we got there early for what we thought would be their normal noon opening time on Saturday. Nope, can release! We were only in line for a bit over an hour, which we heard from various people we met in the tap room who were further ahead of us that they had similar wait times. Buddies who've shipped me stuff were more than happy to Hoover up the 4-packs I offered to them. 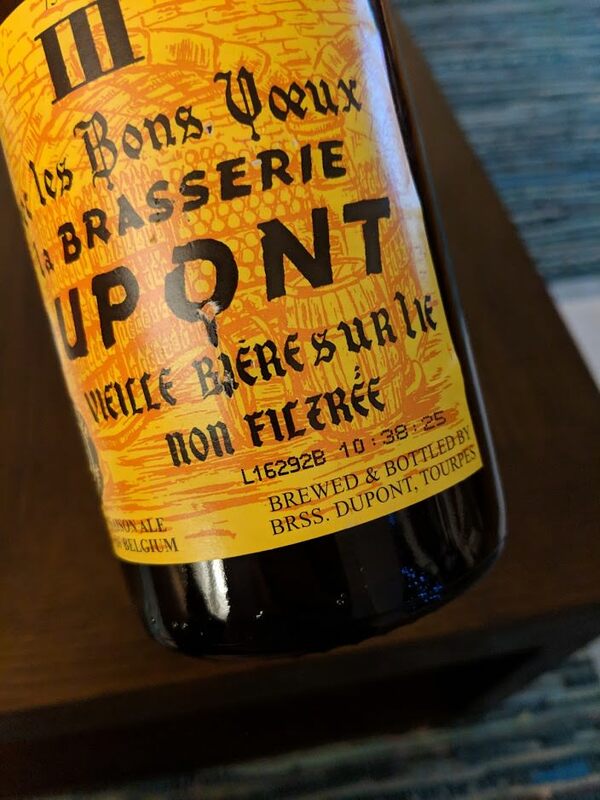 Love how saisons with a little bit of age develop. Came across some of this right before last weekend, and bought a four pack. Daaaaaaamn! Something I look forward to every year. It does need some time to settle down but damn it's tasty. More and more happy each day that Off Color opened the Mousetrap near me. Great experimental and natural fermentation beers. Got two large bottles of their Frambois aged on wine staves. Bottle of wild with apple cider. Two small bottles of their Kriek. And finally a bottle of their farmhouse ale. I remember a few Off Color bottles I really liked. I think it was Hell-Broth? Delicious stuff. 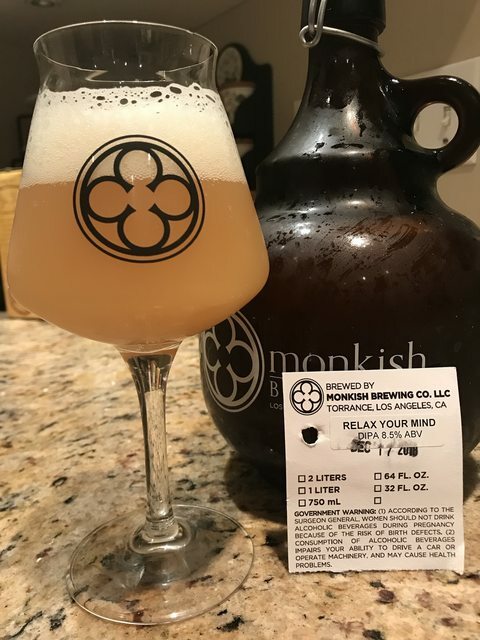 Monkish Brewing Co.Relax Your Mind DIPA. 8.5% ABV. Galaxy Nelson and Simcoe hopped. This new batch is glorious. The southern hemi hops shine, juicy pineapple, mango and passion fruit side by side with sweet mandarine oranges and a touch of bitter citrus pith, there's a delicious orange sorbet flavor/feel that permeates throughout this beer. Mid palate shows a little dank green herbaceous note ( Simcoe ) along with that musty Nelson hop Sauv Blanc trait. Gorgeous soft full mouth that finishes long and juicy. hey guys, our own Rick Allen is hosting a beer tasting challenge for a charity. just post your notes over here and he'll donate to a great cause. Ho, ho, ho! What’s a reasonable price for BCBS? My local store has cases stacked, but I’m guessing it’s because they’re $11.99/bottle and average is $7.99 or something. Thoughts? Monkish Brewing Co. Backpack Full Of Growlers. TIPA. 10% ABV. Hopped with Citra, Nelson and Motueka hops. So this is the third iteration of this beer. First released in cans as Backpack Full Of Cans and then the Collaboration with Side Project called Million Dollar Backpack, the series continues. The hop bills have changed over the three releases and this one gets an additional massive charge of Citra along side the southern hemisphere hops. 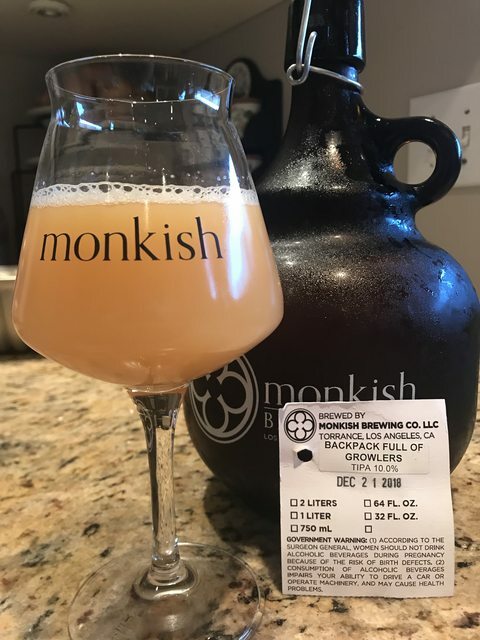 This release was a special growler release for Christmas which for a lot of us who can't do the can release during the days,this is a very special holiday gift indeed. This opens with super aromatics, lots of very sweet orange and over ripe pineapple. Flavors follow the nose. There is a wonderful orange sorbet flavor that carries throughout the beer that weaves in and out alongside super ripe pineapple, mango, papaya and hints of ripe stone fruits. The body is soft and creamy and their is zero booze factor for a 10% Triple, how Henry does this is beyond me. The beer finishes long and juicy with just enough west coast hoppy bitterness to keep it, dare I say, refreshing ! Simply put, one of, if not, the best TIPA Monkish brews. It is only in very rare cases that I don't like an Allagash beer. This is not one of those instances. Reminds me of those raspberry syrup filled dark chocolate cordial things but without the sugar. Delicious. Weihenstephaner Hefeweizen, mixed roughly 50/50 with Barritt’s Ginger Beer. Refreshing and tasty beverage on a warm day. Any beer can be used, but we particularly like it with a Hefe or a Belgian style Wit. 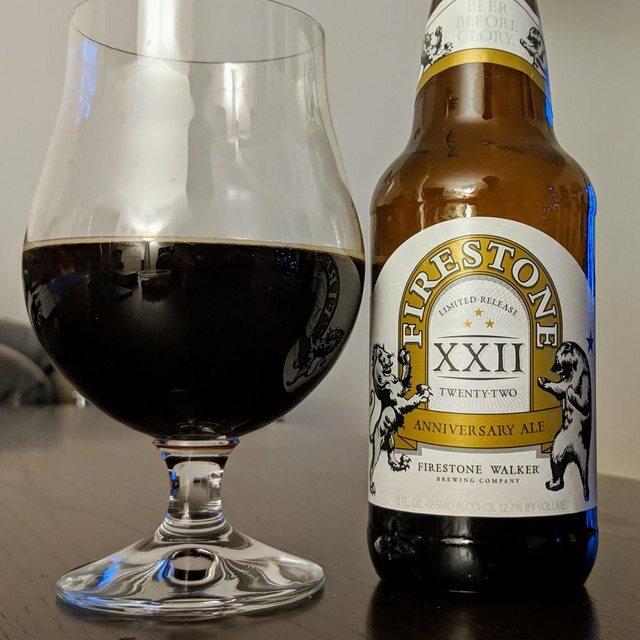 I suppose I should post this on the old beer thread, but I’ll post a pic here as a tease. We just bottled our Helles. I think that I may like it better than the Pils. We also bottled up our samples for the Oregon Beer Awards, which means I got another tasted of Lisa's Rauch Helles, which is delicious. Stopped by u4ic Brewing in Belle Plaine, MN over the holidays. Wide range of styles, but they seem to do Germans the best. Their Schwarzbier is downright excellent, and they had a great Pils and Lager on, too. 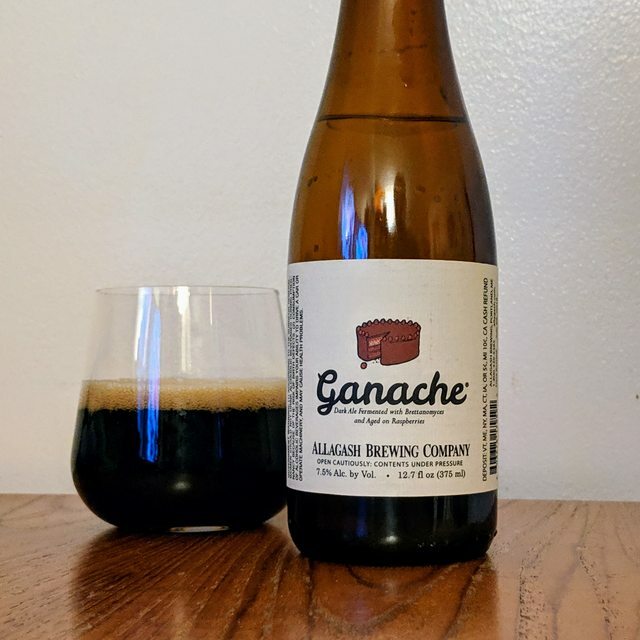 A minty barrel-aged Porter was among my favorites, which surprised me. 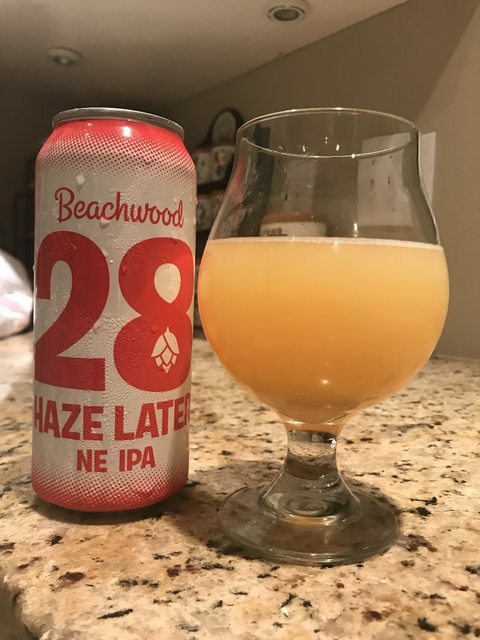 They had a couple hazy IPAs, one being terrible and another very good. Surprisingly, I spied a sack of smoked malt from Bamberg on the brewery floor! Oh, and their own root beer was flippin' fantastic --- so much so that I bought a growler for ice cream floats for my daughter's 3rd. birthday party. 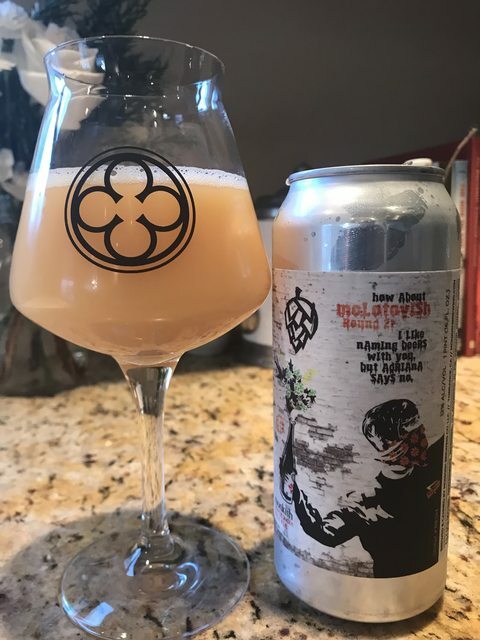 Monkish Brewing Co & Evil Twin Brewing Co., Collaboration, How About Molotovish Round 2 ? I like Naming Beers With you but Adriana Says No.12% ABV. Hopped with Citra, Galaxy and Simcoe hops. Obviously the second iteration of this beast with hop heads Evil Twin Brewing out of Brooklyn NY. I liked batch one a lot for being a massive, albeit quite not in my wheelhouse kinda beer. For this update they basically doubled the amount of all three hops in the hop bill. The beer opens up with insane aromatics as one would imagine with the amount of hops used in this recipe. Huge overripe tropical fruits and sweet ripe orange along with stone fruits and that green dank herbal hop hit, just a great smelling beer. Flavors follow the nose with more pineapple, mango, papaya, sweet tangerine, ripe stone fruits and a massive bitter hop wallop, I am taking one for the team drinking this at one day young and another thing that is incredible with this batch is that there really is no booze heat or bite, or whatever you want to call it, you definitely will feel this beer's ABV but you will not taste it, just amazing balance for such a hop monster. Lush, aromatic, creamy soft but somehow completely approachable for its size. One of the best TIPAs for its size I've had the pleasure of drinking. Cans only. Last edited by BRhoades on January 6th, 2019, 2:26 pm, edited 6 times in total. I am a root beer fanatic Brian and have been really pleased to see some breweries brewing and offering their own root beers for fills. Kern River Brewing brews a delicious hand made root beer that makes amazing root beer floats. Last edited by BRhoades on January 5th, 2019, 4:46 pm, edited 1 time in total. Bring it on. I’ve been on an Andrew-like run lately with high abv Barrel age stouts. Need to return to the light side. What’s the story on the Lemondrop Pils and Export Lager? Rick, will any of this make it's way down south for any of your tap accounts ? Have been slowing down, as well. Drinking quite a bit of MT’s City of the Sun and Georgetown Bodhi lately. Did try a Belching Beaver IPA that tasted like an over-sugared Orange Julius. Was ridiculous. Good to know about Kern River's root beer, Bud! Bud, I'm sending a pallet of bottles and two pallets of kegs to CA next week - 44 kegs in all. Scott, the Export Lager is a high ABV version of Helles - in this case 6.2% (which is a little higher than we really wanted - it should be around 5.75%). It's also called Festbier, and what is usually served at Oktoberfest in Munich. The Lemondrop Pils is the second in a series of beers where we brew a more German-style Pils and use a new world hop that we think might be suited to lagers. The first in the series was the Galaxy Pils, that was finished with the Australian hop Galaxy. The Lemondrop Pils uses a Hopsteiner developed hop, Lemondrop. This hop is a cross between Cascade and an experimental hop grown by the USDA. I find it somewhat similar to Cascade except that it leans lemon rather than grapefruit. It's coming out of fermenter this week, and I'll have a better feel for it then. I'll keep my eyes open for them Rick, hey pardon my ignorance with some of these styles but what is the difference if any, between a Tentbier and a Festbier ? I know your collab with MT was a Tentbier which I absolutely loved. Thanks, Rick. Saw the Export Lager on tap at Brouwer’s, so need to get down there to try. Loved the Galaxy Pils so can’t wait for the Lemonsrop Pils. Hope a few kegs make their way to Seattle or some is left when I visit for OCC weekend. Bud, the Tentbier was a cross between an Export Lager and a Marzen (Amber Lager). Our Export Lager is more pale, with a smoother, less rough malt bill. I'm sending around 16 kegs of it to CA. Scott, I'm sure that some will make its way to SEA. On the other hand, we'll definitely have it at the Tap Room when you're down for OCC. FINALLY got my hands on a bottle of Cascade Noyeaux. So excited to finally try it. Hopefully I am not disappointed. Picked up a six pack of the new Bell's Hopslam release on the way home from work tonight (brewed on 1-9-19). Very enjoyable. From what I recall of last year's release, this version is slightly drier and a little less honeyed, but much more full flavored and intense. Still at 10% alcohol so one can provides a nice buzz. Love drinking these beers in the cold winter months. Modern Times Beer Co. 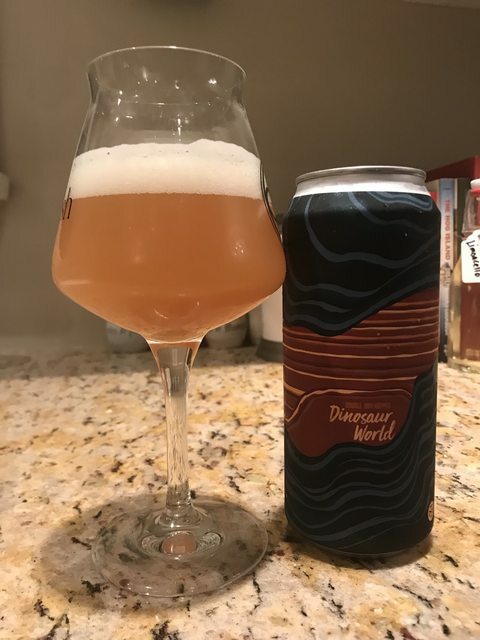 Double Dry Hopped Dinosaur World. 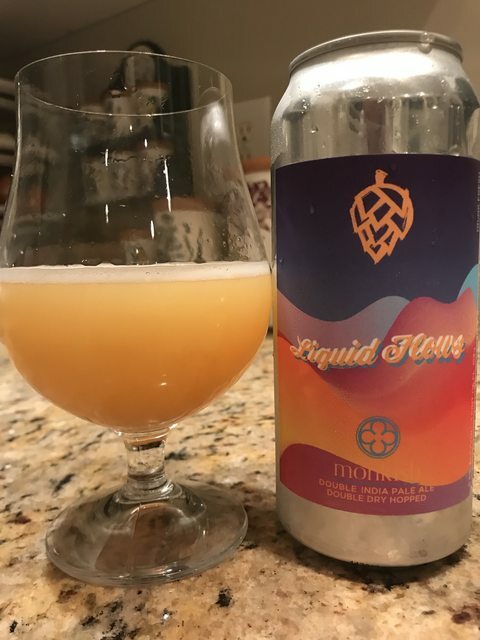 DIPA. 8% ABV. Hopped with Citra, Mosaic and Amarillo with Citra Cyro and Mosaic Cyro hops. Dinosaur World is arguably the most beloved and sought after Modern Times NE styled DIPA. They have released it twice and now for the 3rd iteration we get it DDH'd ! Dino pours a beautiful tangerine hazy orange with an inch of tight packed bubbles. Dino is explosively aromatic, the layers of fragrances that dance out of this thing are amazing, over-ripe crushed pineapple,sweet ripe citrus, leafy green herb's and dank kind bud explode up front, just an insanely great smelling DIPA. Flavors stay true to the nose, huge hit of ripe citrus initially followed by more over ripe tropical fruits. Mid-palate to finish shows bitter citrus pith, sweet berries, melon, papaya and ripe sweet mango. The entire package is carried on a medium soft mouth that finishes remarkably dry and long. This was in the January on-line sale, most MT locations still have it on tap. I spent the weekend helping to judge beer for the Oregon Beer Awards. I was generally impressed with the quality and lack of big flaws. Sunday my group tasted the Pilsner category (we don't enter because I like to judge it), and after three rounds we distilled 40+ entries down to three medalists. I don't find out the winners' names until mid-February, but I'll just say the all six of the finalists were excellent and the winner was superb. Enjoyed your Helles at Bailey’s Taproom last Friday. Also visited Wayfinder while in town and, as usual, enjoyed almost everything we tried. Another new discovery - Ruse Brewing - was a pleasant surprise for those looking for IPAs and stouts. Andrew - was thinking they are right in your wheelhouse. In fact, they are a collaborator on this year’s 3-Way IPA along with our local brewery, Cloudburst. Dipping really deep into Pilsners, and Kolsches these days to reset the palate. Too bad I can't get any of the Heater Allen Kolsch as pickings are kind of slim these days in my bottle shop as craft pilsners and kolsches don't seem to move much. >> Andrew - was thinking they are right in your wheelhouse. In fact, they are a collaborator on this year’s 3-Way IPA along with our local brewery, Cloudburst. Will keep an eye out. Having a Bodhizafa over lunch at Tavern Hall. Don’t believe they distribute here, but keep an eye out for their offerings when in OR or swing by PDX taproom, which is very nice. If you've time, visit Suarez Family Brewing up in Hudson; their pilsners are fantastic. Suarez does a very good job, and is probably the closest that you'll find to what we're doing out here. BTW, we only brew Kolsch for about seven months of the year (April to October), and we're brewing our first batch next week. I've been meaning to plan a trip to Suarez. Might have to speed up those plans. Pizza Port - "Beach Umbrella" IPA --- nu West Coast style. Effin Excellent! Let me know if you've extras; I'd be willing to trade Rick's beers (and others) for more Suarez. Excellent, Bud. Good enough that I had another when we went there for dinner.